Adding your own stamp to your home doesn’t have to break the bank, as you don’t need to completely remodel the kitchen nor rip up carpets throughout, providing they can be thoroughly cleaned and covered up in places with the help of rugs and throws that you love. There’s a way around most design mishaps, as long as you know how to draw attention to other areas, and decorate and accessorize. If you’re not overly creative, then call in the assistance of an artistic friend who can point out ways to brighten up a room, and what to add to make your home individual, fun, and homely. Since you’re on a budget, you’re going to have to be resourceful and to think outside of the box, so here goes! If you’re one for cooking, baking, and entertaining, then you’ll understand the importance of having a practical and spacious kitchen. The kitchen is the soul of the house, especially if you enjoy hosting dinner parties and having your friends congregate at yours. So, with this in mind, make a real effort to improve its appearance and functionality. If your budget permits it, then consider having a small kitchen island installed into the middle of the room to give you ample preparation space as well as giving it a sleek and modern finish. Approach those who specialize in kitchen and bath remodeling to design you a practical kitchen without the price tag of those that require gutting and complete reconstruction. Show your personality by highlighting the hobbies you enjoy in your free time, and this means more than laying out your guitars against the wall. Look to the ceiling for inspiration and to the windows. Create art, stained glass designs, as well as having an array of plants, flowers, and herbs spilling over from shelves and windowsills to illustrate your passion for gardening and cooking, for example. A great way to exhibit your artistic talent and design flair is to make your own art a feature in your home. 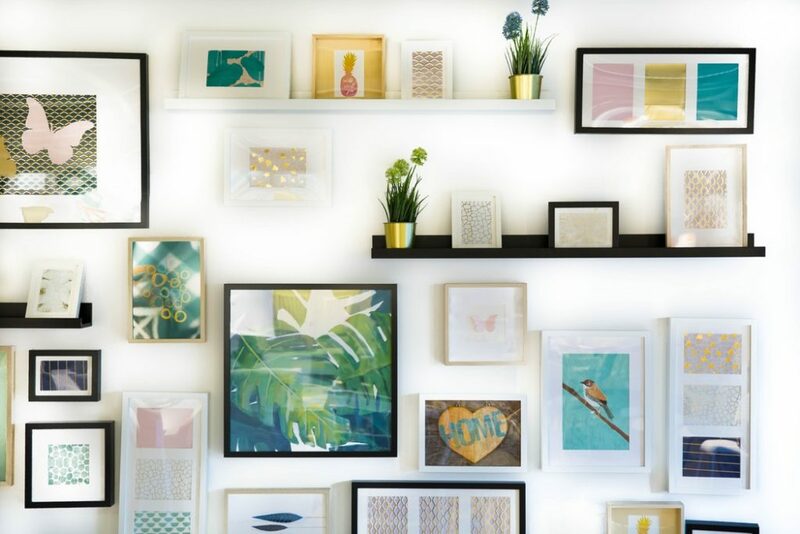 Hang framed pieces, display pottery, and even paint directly onto the walls if you’re brave enough. As long as your home isn’t a rented property, then you can take the reins and express yourself however you wish. Consider trading items you’ve made with others who make their own pottery or furniture, for example. This way, you can keep pieces that have sentimental meaning attached to them – making you feel at home and comforted. Creating your own furniture is far easier than you might first anticipate, so it’s well worth an afternoon of your time. Reclaimed wood is especially trendy right now, and it’s not hard to see why as you can design some truly stunning and sleek pieces relatively easily. Source the wood from laborers or scrap yards (or anywhere else you know), and begin sanding it down and varnishing it for a smooth finish. Secondly, once you’re happy with how the wood looks, affix sturdy hairpin legs onto it and there you have it – a bespoke piece of furniture!